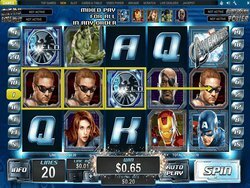 The Avengers movie slot machine is based on the film of the same name that features several of the most popular Marvel characters of all time. Currently, only Playtech is licensed to produce games featuring this brand. It has many great components that include the key characters such as Thor, Iron Man, Captain America, Nick Fury, and more. As you would expect from any blockbuster, this one is packed full of excitement. The betting range is quite large here and like all Marvel titles, it is associated with a tiered progressive jackpot. One of the features is known as the Avengers Assemble. If five of the superhero symbols appear consecutively on a payline, you are awarded 200 times your line bet. The superheroes must all be different such as one each of Hulk, Thor, Iron Man, and Captain America. The wild will not count towards the Assemble, however. While there are some payouts that are higher, this one tends to show up a lot during the game. The Wall of Heroes is activated when three or more Logos appear anywhere on the screen. When this is activated, 20 icons appear and you will need to find three matching symbols in order to activate a free spins game. Each time you match three superheroes in this movie slot machine, you are awarded nine free spins. Once they are over, you are returned to the wall to try and make more matches. This trend continues until you pick a Loki symbol. When this happens, you will be returned to normal gameplay. Each character offers something complete on its own, too. Captain America offers a spin with a random 2x to 5x multiplier. Iron Man spins have a multiplier which increases after every three spins. Thor shoots lightning from his hammer and it makes five symbols randomly appear on the board. The Hulk will appear as a stacked wild on the middle reel to increase winnings. It is during the Wall of Heroes feature where the most money can be won because if you activate several free spin rounds in a row, you can potentially win a lot of money.